This stellar #GlossBoss has a true passion for beauty and glam. She knows how to hustle. Since her career started, she’s been pushing the limits with education, techniques and talent. We can all learn from this fearless, self-taught makeup artist - just go for what you want! Her work is queen-like, stunning, eye-catching and inspirational. We had the chance to interview the brilliantly creative Vanetria, who has been using GlossGenius. Below is our inspirational Q&A with Vanetria. Vanetria: I have been doing makeup for 2.5 years. I started teaching myself by researching schools, classes, etc. Youtube has been a great asset to my education as well. GG: Where did you get your inspiration? Vanetria: My inspiration came from my teacher: Lyric Rochester, who is a Jamaican makeup artist. GG: What is your favorite beauty trick? We love that signature look Vanetria! GG: What is your signature look? Vanetria: My signature look is a soft neutral smokey look with a pop of color. This is paired with a bold lip or sometimes a neutral lip color. GG: What makeup styles do you like doing? Vanetria: Anything! - I love to do all looks from Bridal to high fashion, Halloween or everyday natural and dramatic looks. I LOVE my profession. GG: What is it that keeps your clients always coming back to you? Vanetria: I am always available for them whenever they need me. 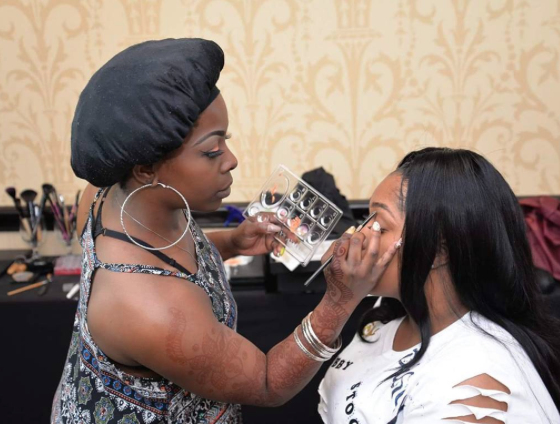 A lot of them say that I match their foundation perfectly…”down to the T!” They have found that other makeup artists have a hard time matching their foundation to their skin tone - either too light or too dark. And I’m so happy to use my skill on clients to get it perfect for them. They always look and feel like celebrities once I'm done. They also really like that my makeup application technique is light and never too much. GG: What do they love about you? GG: What are your goals in the makeup business 2016? Vanetria: One of the big goals I have already accomplished was to enroll in Esthetician school, and continuing to further my education in skincare, makeup, etc. I’m also striving for a small boutique that I can decorate and make really cute, give hands-on classes in and work from it so I can continue to build, build, build my business! GG: What's your favorite thing about GlossGenius? Vanetria: I love how easy it is for my clients to book online. Before GlossGenius I was scheduling out of a notebook, and it was a hassle. GG: How has GlossGenius helped your business? Vanetria: GlossGenius has helped tremendously with building clientele and alleviating the stress from problems like keeping track of appointments or clients cancelling once they have booked. It has been a total relief and I am so happy to be a part of it. Vanetria is truly a talented go-getter! We’ve seen what she’s capable of, and we are thrilled to see what she’ll try next. She’s forging ahead with esthetician school and continuing to push the limits on her beauty domain. If you live near Edmond, Oklahoma, we encourage you to book with Vanetria! What her clients say is true--she will make you look and feel like a celeb! Check out her page here. Interested in learning more about GlossGenius? Sign up for your free trial here!